Have you been thinking about growing an herb garden, but just are not sure of the scale, size, or type of herb garden you want? 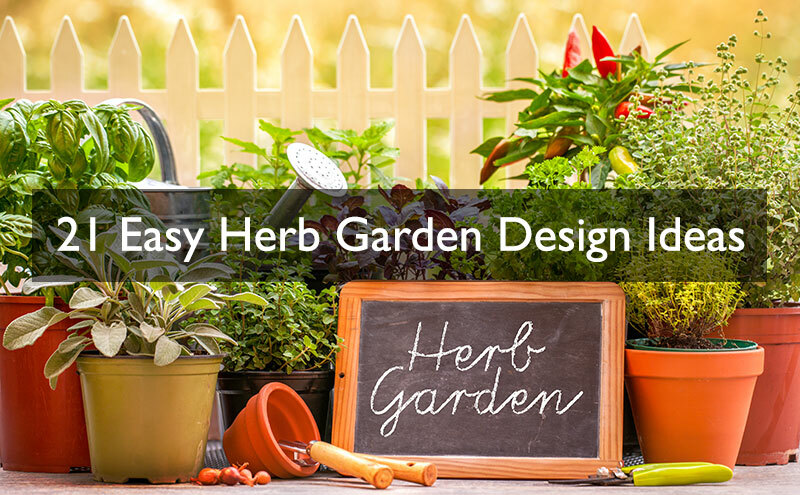 Wondering what type of herb garden best suits you, and more importantly, your property? Whether you live in an apartment or a mansion, there’s an herb garden meant for you that’s easy to maintain and even easier to get started with. Even better, we’ve done the research for you. You can look through this range of small herb gardens ideas and find the best one that meets your lifestyle. Popular herbs to grow include Mint, Oregano, Rosemary, Basil, Sage, Thyme, Bay Leaf, Parsley, Dill, Marjoram and Tarragon. Let’s dive in a little deeper and hopefully, you will find some inspiration. When creating a container herb garden is that you can use almost any container you come across. Everything from trash cans, barrels, bins, boxes, and so much more can be used as a little vessel for herbs to grow in. Container gardens work well for homes that have space with limited lighting. or you plan on putting the containers in a place where there are very few hours of direct sunlight. Just remember, when creating a container herb garden, proper drainage is a MUST. Also, use soil designed for moisture retention. Garden soil that’s heavily enriched with organic matter (at least 30%) or a lightweight soilless potting mix is the perfect recipe for healthy herbs in your container garden. A container herb garden would be the perfect idea for someone looking at starting an herb garden with a low budget. After all, not many people just have empty plant pots just lying around. Getting creative with your containers allows you to keep the cost down. You can make the tiny garden out of anything – even the kitchen sink! Although, we probably wouldn’t recommend that one. Even a shoe box would probably be a better option. The important thing to note is, you have a lot of choices. Honestly, potted herb gardens are just container herb gardens with a more specific name. They’re just containers all the same, after all. However, you can get a better idea of how many herbs you can expect to grow using a pot. It adds an extra level of convenience instead of having to do the guesswork on how many herbs will comfortably fit. For example, a 14-inch pot will leave room for three herbs to grow to their fullest potential. Likewise, you can grow five herbs comfortably in an 18-inch pot. From that point up, you can expect another herb to have space for every two inches extra in diameter. So, a 24-inch pot will comfortably allow eight herbs to grow to their fullest potential. For those that are really limited on their available space and willing to splurge on a pot or two, this might be the best herb garden option for you. For a cheaper, more rustic vertical herb why not upcycle an old pallet. Technically, a container herb garden can sit on your windowsill, also making it a windowsill herb garden. There are a few benefits to utilizing a windowsill container for your herb garden, the biggest of which is lighting. Container herb gardens that don’t have an optimal level of sun exposure will not perform as well as herb gardens that regularly see exposure to the sun. Sitting on the windowsill all day, you can expect your herbs to grow to their fullest extent. Windowsill herb gardens can also make a nice decoration. And if you put the plants on your kitchen windowsill you can keep an eye on your herbs while you are cooking or washing dishes. If you’re looking to just grow one specific herb or a small number of herbs, a tiny herb garden might be your best bet. There are tiny herb garden kits you can pick up from the store or online that make it even easier to put your little garden together. A bamboo culinary herb kit, for example, is a tiny little planter designed to keep herbs like parsley or oregano handy in a pinch. It’s so small you can keep it as a centerpiece on your kitchen table, outside your window, or hanging up on a wall somewhere out of sight and out of mind until you need it. Companion planting is the planting of a range of crops in proximity to each other for a variety of reasons. You can utilize herbs to keep pests away from plants. You can also use herbs to promoting pollination for plants by attracting pollinating insects. Or companion planting is just a great way you can maximize the use the space you have available. In the photo above bm_secretgarden has tried some dill as companion plants in her garden. The result is some beautiful dill flowers and she can also use the dill in some tasty potatoes or fish recipes. When it comes to crafting a gorgeous herb garden, you can utilize companion planting with certain vegetables to limit the number of pests in your garden and help your entire garden flourish. But be warned, some varieties of herbs can be invasive. Invasive plants are often better potted to keep them under control and to stop them taking over your entire garden. Many herbs can grow very well in a hydroponic setting. Everyday herbs like oregano, rosemary, and parsley can all thrive in a hydroponic situation. In fact, there are several advantages to having a hydroponic herb garden instead of a dry garden you must water every day – the biggest advantage being, you don’t have to water it every day. Better than the fact that you don’t have to put a whole lot of tender care into it after it’s all set up is the fact that hydroponic herbs will grow at a 30-50 percent rate faster than their dry soiled companions. The yield of each herb plant will also be greater, providing you with ultimately more plant for your time and energy. Here’s the thing about bottle herb gardens – they basically water themselves. In fact, there are some bottle gardens that last years, sometimes decades, and there are numerous records of some bottle gardens lasting over 50 years. For those that may not remember to water their plants as much as they’d like, this is probably the herb garden type for you. You don’t have to feel guilty about forgetting to water a plant if it never needs to be watered! This is the very definition of an easy herb garden. Get the full bottle herb garden tutorial here and you can learn how to cut glass bottles here. If you just want space to grow a few herbs and you like fish then perhaps a fish tank herb garden could be for you. Ddavidboettcher posted a snap of this gutter herb garden on instagram. I suppose it’s a riff on the random container herb garden but worth a mention on its own I think. While it may have been implied up earlier that the herb gardens that go in your windowsill or in a container go in your kitchen, those can still technically be placed in different rooms of the house so long as it has ample access to sunlight. An indoor kitchen herb garden is simply a garden designed with your kitchen in mind, so it’s centered somewhere in the kitchen that makes harvesting herbs for cooking incredibly easy. Having it held up on a wall by a hanging pot or somewhere eye level is recommended for the most ease. Do you enjoy a good herbal tea? Are you interested more in turning your herbs into aromatic beverages rather than tools for medicinal or culinary purposes? Once you get the right herbs planted, you can begin the adventure of having your very own herbal tea garden. Filling your garden to the brim with herbs like chamomile, fennel, mint, rose hips, jasmine, lavender, lemon balm, and ginger means come harvest time, you’ll have an array of options for your favorite hot beverage. Not only that, but your herbs will give off fragrant aromas in the meantime. The scent of fresh herbs is one of the best parts to having an herb garden, so building a garden around that fact is a one-way ticket to happiness for you. A fragrant herb garden really focuses on the scent sense to let you know everything is running smoothly, and it can have delicious herbs like lemon balm, mint, and lavender to provide you with a range of benefits to boot. Not just that, but there is some science behind the benefits of a fragrant herb garden, as well. Lavender, for example, can induce sleep and relax the mind, while rosemary can improve alertness. If you plan your herb garden around fragrances you can then also start to make your own essential oils or potpourri. It’s not as hard as you might think. Check this video for an example. Medicinal herb gardens have taken a backseat to their cooking herb counterparts in the past few decades. As access to modern medicine and hospitals increases, the use of medicinal herbs continues to decrease. Underrated for their time, the right herbs can still work well for everything from asthma and bronchitis to anxiety and diabetes. Without getting into too much detail on which herb works for which medicinal purpose, you have hundreds of options to choose from, so it will ultimately depend on the ailment you’re trying to resolve or heal from. Many of these herbs will work hand in hand in the same container, so you can grow more than one at one time. Plus, with a medicinal herb garden, you’ll be the friend who always has a cure any time their buddy comes over with a sickness or mild allergy. Who wouldn’t want to be their friend’s herb doctor? On second thought, don’t answer that. As the name implies, it’s all about the aesthetic quality for this herb garden! An ornamental herb garden must look the part above anything else, with each herb posed as an ornamental addition to the overall garden or landscape. The type of ornamental herb garden you have will greatly depend on the herbs you choose to use for the garden. For example, there are flowering herbs that can blossom into aromatic shrubs, like thyme. At the same time, there are herbs that provide another ornamental factor to a garden – like the parsley that attracts beautiful swallowtail butterflies. An ornamental herb garden can be big or small, also greatly depending on the type of herbs you choose to use. If your focus is finding an herb garden that will fit in a small space, this might not be the best choice for you. Rather, if you’re looking to add an extra aesthetic spark to your house or yard, an ornamental garden might be right up your ally. If you know for sure you’re in a situation where there’s no chance your little herb plants will receive any form of extended sun exposure, that’s okay – you just must understand which herbs are best to use. In a situation where you know your garden is going to have very little sunlight access, all you have to do is pick herbs that thrive in dim lighting. In fact, there are some herbs that can grow in shade or virtually no lighting at all. Utilizing these herbs in your garden means it’s going to thrive even on the darkest of days, making a living room or bedroom garden totally possible. You could even grow a garden in your bathroom if your heart really wanted to. If you have a spot in your yard that a raised bed could lay in for years or even decades to come, then a raised bed herb garden may be the ideal situation for you. This is for a situation where you know you’re going to have at least small access to an area outside that will have at least eight hours of sun exposure each day. If you do have limited space, you can start out with just one raised bed and go up from there as you feel comfortable. Just one raised bed will allow you to grow a large handful of herbs at one time, depending on the herbs in question. You’ll only want more than one bed if you intend on growing a large number of herbs at one time. A raised bed herb garden can be great because you don’t need to bend over so much when you are pruning and harvesting. It’s more work in the short term but you will appreciate it in the long term. Personally, I was able to make a container herb garden after all my research, which is why I picked it for number one on the list. Overall, it was easy to make and a brilliant addition to my kitchen. What is your favorite type of herb garden now that you’re better informed about your options, and what herbs will you be planting this season? Be sure to check out my list of herbs to plant and their specific purposes if you’re unsure of what to plant or you want to know all your choices! Let me know what you think about this list in the comments. If you liked the article, please give it a share!